Today was another cold day with temps in the -8 to -6 Deg C and moderate winds at Sargents Mountain. Sargents mountain is a popular destination for backcountry skiers, and is located due east of Brundage Mountain Ski Resort. Early in the morning I had my first BSU-Geophysics research related meetings with a good friend, Dave Bingman. Dave is the director and lead forecaster for the Payette Avalanche Center (PAC) in McCall. We identified research initiatives that will help PAC with forecasting, discussed avalanche education needs, and toured Sargents to get a pulse on the constantly changing snowpack. The next set of pictures summarizes the conditions: Wind Affected snow at slopes with due West, East, and South aspects! Raised skin track - wind removed unpacked snow of the ridge. Raised pole plants - where did the snow go? The alpine terrain was getting hammered by the wind today. Check the massive plumes we could see from miles away. Sawtooth Peak - I think ... not sure! Not surprisingly, stiff and brittle wind slabs could be easily found. Snow fracture under my skis. Dave got his own crack. The snow quality was not espectacular due to the wind effect, but scattered pockets of soft snow can be found at mid-slopes with the protection of timber. Regardless of the skiing, the views were striking! Black Tip in the center @ Payette River Mountains. Nature Window - sculpted from snow and rime. We had a grand time today while looking at snowpits at SW and N aspects. The two snowpits were remarkably different with a 70-90 cm deep dense snowpack at 7800 feet elevation SW aspect slope and a 3 meter deep snowpack at 7800 feet elevation North aspect slope. I was surprise also how much different the snowpack structure from Mores Creek Summit, Sargents, Angels Basin - Antony Lakes, and Copper Mountain during this season. Sargents snowpack is significantly more complex than the other regional snowpacks, with a multitude of crust layers and temperature gradients. 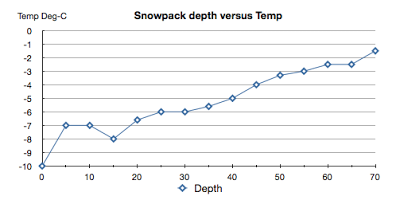 The snowpack depth versus temp plot for the SW snow pit shown below. Notice that the critical 1 deg-C per 10 cm exceded through its width. very likely these gradients will continue to decompose the various existing crusts. This is a concern, because it is possible for subtle facet layer do develop and become reactive later in the season - definitely not good! The top 1.5 meter - a much deeper snowpack for the North Aspect is illustrated in the next picture. The snowpack is fairly progressive from Fist to 4 fingers to 1 finger. However, crust layers were identified at each of the transitions of hardness changes with weak layers consisting of facets, mix grains, and decomposing crust crystals. Compression tests at the N aspect snow pit produced easy triggers with Q2 scores at the 25-30 cm depth. Compression results at other depths with weak layers were unremarkable. However, there was a layer at the 70 cm that did not inspired confidence, due to its rate of crust decomposition where facetting is active above and below the crust. The recent wind events, early season variability in snowpack depth and structure, as well as crusts stratigraphy will demand that we carefully evaluate any steep slope we intend to ski! And I would greatly encourage for readers of this blog to submit observations to each of the avalanche centers. 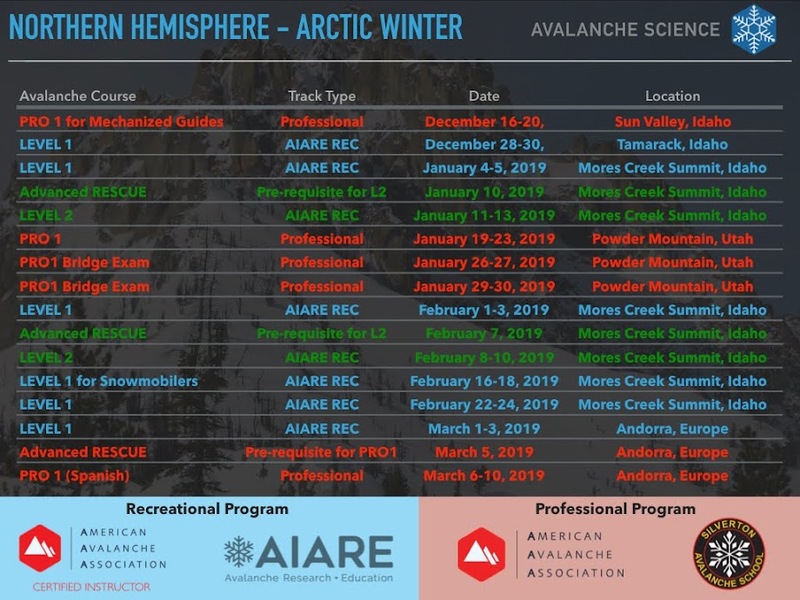 It is a good idea to wear your avalanche transcievers, and carry your backpack with avalanche rescue gear if you intend to ski inbounds steep terrain, particularly after a snow precipitation event. Also, remember to have a SKI BUDDY! You need somebody to recue you.